Read this article’s learning objectives (Link to CE Test: Nutritional Management of Chronic Kidney Disease in Cats & Dogs at the end of the article) and accompanying continuing education quiz. CE credit and RACE-approval provided by vetmedteam.com. Treatment recommendations for CKD: iris-kidney.com/guidelines/recommendations.aspx. Therapeutic kidney diets are used to improve a patient’s quality of life by controlling signs of uremia and increasing life span by altering disease progression. Double-blinded, randomized, controlled clinical trials have compared the effectiveness of diets formulated for CKD with adult maintenance diets in dogs and cats. The studies evaluated characteristics of therapeutic kidney diets, such as reduced phosphorus, protein, and sodium and the addition of omega-3 fatty acids (eicosapentaenoic acid [EPA] and docosahexaenoic acid [DHA]) (Table 2). In a study by Ross and colleagues, cats with spontaneous IRIS stage 2 and 3 CKD were fed a therapeutic kidney diet (n = 22) or an adult maintenance diet (n = 23) and evaluated for 24 months.2 In the therapeutic diet group, no cats experienced a uremic crisis and no renal-related deaths occurred, whereas, in the maintenance diet group, 26% of cats had uremic crisis and 21.7% of cats died of renal-related causes. In a study by Elliott and colleagues, client-owned cats with spontaneous stable CKD were fed a therapeutic kidney diet (n = 29) or an adult maintenance diet (n = 21).3 Those fed a maintenance diet received one because they refused a therapeutic kidney diet or their owners did not want to change their diet. Feeding a therapeutic kidney diet helped reduce plasma phosphate, blood urea nitrogen, and parathyroid hormone concentrations. The median survival time for cats receiving a therapeutic kidney diet was 633 days (1.7 years) compared with 264 days (0.7 years) for cats receiving a maintenance diet. In a study by Jacob and colleagues, dogs with spontaneous IRIS stage 2 or greater CKD were fed a therapeutic kidney diet (n = 21) or adult maintenance diet (n = 17) and evaluated for 24 months.4 Dogs in the therapeutic kidney diet group had a median time to uremic crisis of 615 days (1.7 years) and a median time of 594 days (1.6 years) before deaths occurred, while those in the maintenance diet group had median times to uremic crisis of 252 days (0.7 years) and 188 days (0.5 years) before deaths occurred, respectively. At the end of the study, only 33% of dogs in the therapeutic kidney diet group died of a renal-related cause compared with 65% of dogs in the maintenance group. Additional nutrient considerations include fat, acid–base balance, antioxidants, and fiber. In the November/December 2015 issue of Today’s Veterinary Practice, the article—The Protein Paradigm: Assessing Dietary Protein in Health & Disease—provided an in-depth discussion of the implications of dietary protein in both healthy dogs and cats and those affected by obesity, urinary tract and kidney disease, food allergies, and liver disease. Protein restricted diets are commonly recommended for the management of CKD in both cats and dogs. The primary reasons a protein restricted diet is recommended include reduction in nitrogenous wastes and glomerular proteinuria. Anemia through gastrointestinal ulceration and blood loss. Nitrogenous wastes may also shorten the life span of red blood cells5 and cause platelet dysfunction6 as demonstrated in the human literature. However, the necessity of protein restriction for both dogs and cats has remained a point of controversy and discussion for many years. This includes the timing at which protein restriction should occur and the provision of sufficient dietary protein to avoid protein malnutrition and loss of lean body mass. The role of protein restriction in the progression of CKD in both cats and dogs is unclear. Nitrogen balance was achieved with a diet containing 56 g protein/1000 kcal. Nitrogen balance can be achieved on a low protein diet; however, this may be at the expense of lean body mass through the utilization of endogenous proteins. A diet containing 95 g protein/1000 kcal was needed to maintain lean body mass. On the basis of regression analysis, the researchers suggested that, although 1.5 g protein/kg body weight is required for nitrogen balance in adult cats, 5.2 g/kg is recommended to maintain lean body mass. This study was performed in healthy adult male cats, and additional studies are needed to evaluate the protein requirement to maintain lean body mass in dogs and cats with CKD. 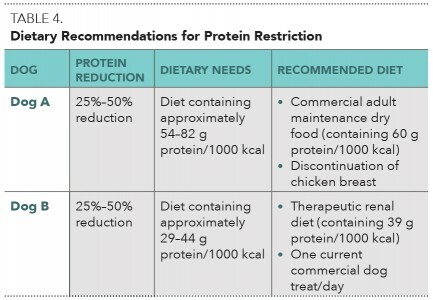 The amount of protein needed to achieve restriction is not clearly defined. Categories for low, moderate, and high protein diets are provided10 (Table 3) but, for some animals, protein restriction may be relative to their current intake based on an accurate diet history (see Examples of Protein Restriction Relative to Current Intake). In addition, protein restriction does not equate to feeding below the established NRC minimum nutritional requirements. At this time, typical therapeutic diets labeled for various stages of CKD range from 25 to 55 g/1000 kcal for dogs and 58 to 82 g/1000 kcal for cats, with allowance for some tailoring of protein content to a patient’s needs. Two 10-kg spayed female mixed breed dogs with glomerular proteinuria and IRIS stage 1 CKD are consuming approximately 550 kcal/day (calculation, 1.4 × (70 × kg body weight0.75)). Diet recommendations are listed in Table 4. Proteinuria is inversely associated with survival in azotemic cats and significantly associated with the development of azotemia in nonazotemic cats.17,18 Studies investigating the role of reduced protein diets in cats are limited to those with confounding dietary variables, such as phosphorus restriction. As a result, the independent influence of protein on disease progression in these patients is not well known. In both dogs and cats with IRIS stages 3 and 4 CKD, reduced protein intake may help reduce accumulation of nitrogenous wastes from protein metabolism that contribute to azotemia and uremia. High protein intake may exacerbate uremia, contributing to the morbidity associated with CKD. Studies in both dogs and cats with CKD have demonstrated that modifying protein intake reduces blood urea nitrogen.2,3 While urea is not a major uremic toxin in cats and dogs, it is a marker for nitrogenous wastes that contribute to uremia. Additionally, hyporexia, which occurs commonly with late stage CKD and/or suboptimal protein intake, can increase the production of uremic toxins through endogenous protein catabolism. 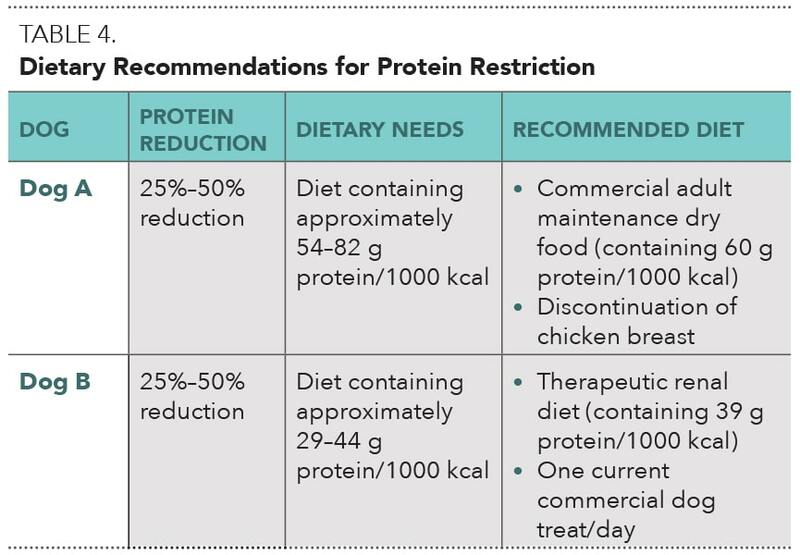 Prevention of cachexia and protein malnutrition are the primary reasons clinicians debate protein restriction. 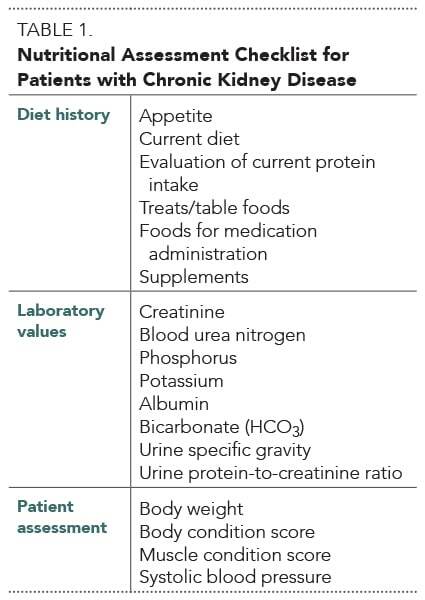 Each patient should be assessed individually for signs of cachexia, and protein intake should be balanced in light of proteinuria and uremia. The role of protein restriction in the progression of CKD in dogs and cats is not clear at this time and requires further investigation. In studies demonstrating improved survival times in dogs and cats receiving a therapeutic kidney diet compared with those eating a maintenance diet, the benefit of protein restriction cannot be separated from the benefits of phosphorus restriction and other characteristics of therapeutic kidney diets. In the veterinary literature, no definitive conclusion has been reached regarding which diet is more beneficial for dogs and cats with CKD: a diet with unrestricted protein but the remaining features of therapeutic renal diets or a protein restricted therapeutic renal diet. This is likely dependent on the IRIS stage and substage of disease. Phosphorus retention and subsequent hyperphosphatemia are common in patients with CKD due to decreased glomerular filtration. This results in renal secondary hyperparathyroidism and calcitriol deficiency, and can lead to soft tissue mineralization and fibrous osteodystrophy. Phosphorus restriction, independent of other nutritional factors, delays progression of CKD; thus, it is a vitally important nutrient, if not the most important, with regard to nutrition for patients with renal disease. Due to the high phosphorus content of many meat-based proteins, reducing protein content also helps reduce the total phosphorus content of a diet. Maintenance diets often contain added phosphorus beyond that found in protein because, in healthy animals, phosphorus deficiency is more concerning than excess phosphorus. While maintenance diets generally contain greater than 1.5 g/1000 kcal of phosphorus, the phosphorus content of typical therapeutic diets labeled for various stages of CKD ranges from 0.4 to 1.2 g/1000 kcal and 0.8 to 1.35 g/1000 kcal for dogs and cats, respectively. High phosphorus diet (1.44% DMB; estimated 3.6 g/1000 kcal). Over a 24-month period, dogs receiving the high phosphorus diet had significantly lower glomerular filtration rates and decreased survival compared with those in the phosphorus restricted group (survival, 33% versus 75%). Low phosphorus diet (0.24% DMB; estimated 0.6 g/1000 kcal) had mild to no histologic changes. Less than 5 mg/dL (1.6 mmol/L) and less than 6 mg/dL (1.9 mmol/L) for patients with IRIS stages 3 and 4 CKD, respectively. If hyperphosphatemia persists despite dietary phosphorus restriction, then an enteric phosphate binder, such as aluminum hydroxide, is recommended with each meal. Plasma phosphate concentrations should be monitored every 2 to 4 weeks until the target concentration is achieved. Supplementation with polyunsaturated omega-3 fatty acids (EPA and DHA) exerts renoprotective effects. Dogs with experimentally induced renal disease fed a diet supplemented with a high dose of fish oil had reduced proteinuria, creatinine, and histopathologic lesions (decreased mesangial matrix expansion, glomerulosclerosis, and renal interstitial cellular infiltrates) compared with those fed diets supplemented with safflower oil or beef tallow.23 All diets with supplemental fat had an overall content of 16.8% fat on a DMB (approximately 42 g/1000 kcal assuming the diet contained 4000 kcal/kg on a DMB in which the base diet contained 1.8% fat DMB, or approximately 4.5 g/1000 kcal). Companies often add omega-3 fatty acids, including EPA, DHA, and alpha-linolenic acid, to therapeutic kidney diets. However, alpha-linolenic acid is insufficiently converted to EPA and DHA in both dogs and cats. Therefore, if additional supplementation is considered and EPA and DHA levels on a g/1000 kcal basis are not available, contacting the manufacturer is recommended. Reducing sodium intake may be beneficial in patients with CKD due to sodium retention and the potential for systemic arterial hypertension. At this time, no evidence suggests that decreasing dietary sodium reduces arterial blood pressure in cats and dogs. Recent studies in healthy aged cats without CKD did not demonstrate an effect of a high sodium diet (3.1 g/1000 kcal) compared with a lower sodium diet (1 g/1000 kcal) on renal function or arterial blood pressure.26,27 However, these studies have not been performed in cats with CKD. Increased plasma aldosterone concentration was noted in dogs with asymptomatic chronic valvular disease that were fed a diet containing 0.32 g sodium/1000 kcal fed for 4 weeks.28 Diets significantly reduced in sodium may activate the renin-angiotensin-aldosterone system, which could be detrimental to patients with CKD, although further studies are needed. The sodium content of typical therapeutic diets labeled for various stages of CKD ranges from 0.4 to 1.2 g/1000 kcal for dogs and 0.5 to 1 g/1000 kcal for cats. Hypokalemia is common in cats with CKD, and diets formulated for CKD may provide supplemental potassium beyond that added to maintenance diets. The typical potassium content of therapeutic kidney diets for cats ranges from 1.4 to 2.6 g/1000 kcal. Maintaining the plasma potassium concentration in the middle or upper half of the laboratory reference range is recommended. Oral supplementation with potassium gluconate (2 mEq/kg PO Q 12 H) or potassium citrate (75 mg/kg PO Q 12 H) is recommended if persistent hypokalemia is noted despite feeding an appropriate therapeutic diet. Although hyperkalemia is typically associated with acute kidney failure, it may be a complication in some dogs with CKD. Hyperkalemia has been corrected in dogs with CKD by feeding home-prepared potassium reduced diets (0.91 ± 0.14 g/1000 kcal).29 Therapeutic kidney diets for dogs contain 0.8 to 2.1 g/1000 kcal; therefore, some (although limited) commercial therapeutic kidney diets provide potassium within a range reported to correct hyperkalemia in dogs. Consultation with a board-certified veterinary nutritionist for home-prepared diet formulation should be considered if hyperkalemia persists in a dog with CKD. Added soluble fiber to promote colonic bacterial growth and utilization of nitrogen and urea; soluble fiber may also be beneficial in cats with constipation, a common complication in cats with CKD. Underweight dogs and cats should be fed to gain weight or, if warranted, should receive assisted feeding to facilitate intake of calories. Dogs and cats with ideal body weight should be fed to maintain their current body weight. Feeding amounts should be adjusted if body weight decreases or muscle condition score changes. Overweight/obese dogs and cats must be assessed on an individual basis. Overweight or obese dogs and cats may have more muscle mass to protect against catabolic disease processes, such as CKD, although further research is needed to explore this hypothesis. Generally, use of a therapeutic kidney diet takes precedence in dogs and cats with later stage CKD. In obese dogs and cats with early stage CKD (IRIS stage 1 ± 2), a weight loss plan may be considered after a complete nutritional assessment and only if close monitoring is available. If progression of CKD is noted, active weight loss should be suspended and appropriate diet modifications should occur until further evaluation. Consultation with a board-certified veterinary nutritionist is recommended for obese patients with CKD. Several therapeutic kidney diets in a variety of forms, flavors, and textures are available for both cats and dogs. Introducing a patient to a therapeutic kidney diet is recommended before signs of uremia occur, although this is not always possible. Samples of various therapeutic diets should be sent home with patients to establish their preferences after diagnosis. Use caution when introducing a therapeutic kidney diet to a hospitalized patient because this may lead to aversion to a diet suggested for long-term feeding. Feeding tubes can be useful, especially with patients in uremic crisis. Liquid enteral formulations within the recommended nutrient criteria are advised for nasoesophageal or nasogastric feeding tubes. When esophagostomy or gastrostomy feeding tubes are in place, a slurry of a canned therapeutic diet is recommended. To improve the caloric density of a slurry and decrease the volume of slurry administered, use of a liquid enteral diet rather than water is recommended to create a slurry with the selected canned diet. Ideally, the liquid diet should be phosphorus restricted. Most liquid diets designed for over-the-counter use in humans and in convalescent veterinary patients contain less than 1.5 g phosphorus/1000 kcal. Water needs and medications can also be supplied through the feeding tube. Mineral inadequacies, including calcium deficiency (56.4% of canine and 25% of feline recipes). Before referral, updated IRIS staging, including systolic blood pressure and UPC, is recommended. Nutritional intervention in a cat or dog with CKD can greatly affect morbidity and mortality. Diet selection should be based on a complete nutritional assessment of the patient, including staging the patient’s CKD. Supplementation with the omega-3 fatty acids EPA and DHA is recommended if the diet does not provide those nutrients. Patients with a poor or selective appetite may benefit from assisted feeding or consultation with a board-certified veterinary nutritionist for a home-prepared diet formulation. 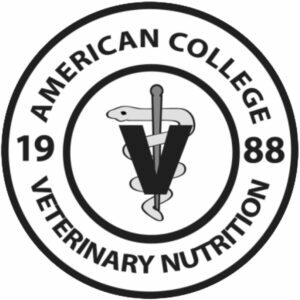 A directory of board-certified veterinary nutritionists is available at acvn.org/directory. Freeman L, Becvarova I, Cave N, et al. WSAVA nutritional assessment guidelines. J Small Anim Pract 2011; 52:385-396. Ross SJ, Osborne CA, Kirk CA, et al. Clinical evaluation of dietary modification for treatment of spontaneous chronic kidney disease in cats. JAVMA 2006; 229(6):949-957. Elliott J, Rawlings JM, Markwell PJ, et al. Survival of cats with naturally occurring chronic renal failure: Effect of dietary management. J Small Anim Pract 2000; 41(6):235-242. Jacob F, Polzin DJ, Osborne CA, et al. Clinical evaluation of dietary modification for treatment of spontaneous chronic renal failure in dogs. JAVMA 2002; 220(8):1163-1170. Ahmed MS, Abed M, Voelkl J, et al. Triggering of suicidal erythrocyte death by uremic toxin indoxyl sulfate. BMC Nephrol 2013; 14:244. Li M, Wang Z, Ma T, et al. Enhanced platelet apoptosis in chronic uremic patients. Ren Fail 2014; 36(6):847-853. Association of American Feed Control Officials. Official Publication. Champaign, IL: Association of American Feed Control Officials, 2016. Laflamme DP, Hannah SS. Discrepancy between use of lean body mass or nitrogen balance to determine protein requirements for adult cats. J Feline Med Surg 2013; 15(8):691-697. Shmalberg J. Beyond the guaranteed analysis: Comparing pet foods. Today Vet Pract 2013; 3(1):43. IRIS Canine GN Study Group Standard Therapy Subgroup, Brown S, Elliott J, et al. Consensus recommendations for standard therapy of glomerular disease in dogs. J Vet Intern Med 2013; 27 Suppl 1:27-43. Valli VE, Baumal R, Thorner P, et al. Dietary modification reduces splitting of glomerular basement membranes and delays death due to renal failure in canine X-linked hereditary nephritis. Lab Invest 1991; 65(1):67-73. Remuzzi G, Bertani T. Pathophysiology of progressive nephropathies. N Engl J Med 1998; 339(20):1448-1456. Jacob F, Polzin DJ, Osborne CA, et al. Evaluation of the association between initial proteinuria and morbidity rate or death in dogs with naturally occurring chronic renal failure. JAVMA 2005; 226(3):393-400. Burkholder WJ, Lees GE, LeBlanc AK, et al. Diet modulates proteinuria in heterozygous female dogs with X-linked hereditary nephropathy. J Vet Intern Med 2004; 18(2):165-175. Parker VJ, Freeman LM. Focus on nutrition: Nutritional management of protein-losing nephropathy in dogs. Compend Contin Educ Pract Vet 2012; 34(7):E6. Syme HM, Markwell PJ, Pfeiffer D, et al. Survival of cats with naturally occurring chronic renal failure is related to severity of proteinuria. J Vet Intern Med 2006; 20(3):528-535. Jepson RE, Brodbelt D, Vallance C, et al. Evaluation of predictors of the development of azotemia in cats. J Vet Intern Med 2009; 23(4):806-813. Freeman LM. Cachexia and sarcopenia: Emerging syndromes of importance in dogs and cats. J Vet Intern Med 2012; 26(1):3-17. Parker VJ, Freeman LM. Association between body condition and survival in dogs with acquired chronic kidney disease. J Vet Intern Med 2011; 25(6):1306-1311. Finco DR, Brown SA, Crowell WA, et al. Effects of phosphorus/calcium-restricted and phosphorus/calcium-replete 32% protein diets in dogs with chronic renal failure. Am J Vet Res 1992; 53(1):157-163. Ross LA, Finco DR, Crowell WA. Effect of dietary phosphorus restriction on the kidneys of cats with reduced renal mass. Am J Vet Res 1982; 43(6):1023-1026. Brown SA, Brown CA, Crowell WA, et al. Beneficial effects of chronic administration of dietary omega-3 polyunsaturated fatty acids in dogs with renal insufficiency. J Lab Clin Med 1998; 131(5):447-455. Plantinga EA, Everts H, Kastelein AMC, et al. Retrospective study of the survival of cats with acquired chronic renal insufficiency offered different commercial diets. Vet Rec 2005; 157(7):185-187. Chetboul V, Reynolds BS, Trehiou-Sechi E, et al. Cardiovascular effects of dietary salt intake in aged healthy cats: A 2-year prospective randomized, blinded, and controlled study. PloS One 2014; 9(6):e97862. Reynolds BS, Chetboul V, Nguyen P, et al. Effects of dietary salt intake on renal function: A 2-year study in healthy aged cats. J Vet Intern Med 2013; 27(3):507-515. Freeman LM, Rush JE, Markwell PJ. Effects of dietary modification in dogs with early chronic valvular disease. J Vet Intern Med 2006; 20(5):1116-1126. Segev G, Fascetti AJ, Weeth LP, et al. Correction of hyperkalemia in dogs with chronic kidney disease consuming commercial renal therapeutic diets by a potassium-reduced home-prepared diet. J Vet Intern Med 2010; 24(3):546-550. Larsen JA, Parks EM, Heinze CR, et al. Evaluation of recipes for home-prepared diets for dogs and cats with chronic kidney disease. JAVMA 2012; 240(5):532-538. The article you have read is RACE approved for 1 hour of continuing education credit. To receive credit, take the approved test at VetMedTeam.com. A $5 fee applies. Questions and answers may differ from those below. Tests are valid for 2 years from the date of approval. After reading this article, readers should be able to identify the role of key nutritional factors for chronic kidney disease (CKD) patients as well as prepare an appropriate nutritional plan for cats and dogs with CKD based on a complete nutritional assessment. 1. Based on International Renal Interest Society (IRIS) guidelines, when is nutritional intervention for both dogs and cats recommended? 2. Which omega-3 fatty acid can be supplemented to pet food, but is inefficiently converted to eicosapentaenoic acid (EPA) and docosahexaenoic acid (DHA) in dogs and cats? 3. What type of studies have been performed in both cats and dogs to provide evidence-based medicine that therapeutic kidney diets improve a patient’s quality of life and increase life span? 4. Improvement of anemia may be associated with restriction of which of the following nutrients? 5. Urea is a major uremic toxin in the dog and cat. 6. Restriction of which one of the following nutrients has been independently shown to delay the progression of CKD in both dogs and cats? 7. The following uncommon electrolyte disturbance in dogs with CKD has been corrected by feeding a home-prepared diet formulated by a board-certified veterinary nutritionist. 8. The protein requirement of dogs and cats is typically evaluated through the use of nitrogen balance studies. What is another method for evaluating the protein requirement? 9. Which of the following is a concern regarding feeding a protein restricted diet to a patient with CKD? 10. Reducing protein intake by 25% to 50% of current intake based on an accurate diet history in a patient with moderate glomerular proteinuria and mild azotemia is a reasonable recommendation. Questions and answers online may differ from those at right; tests are valid for 2 years from date of approval. Martha G. Cline, DVM, Diplomate ACVN, practices small animal veterinary clinical nutrition at Red Bank Veterinary Hospital in Tinton Falls, New Jersey. 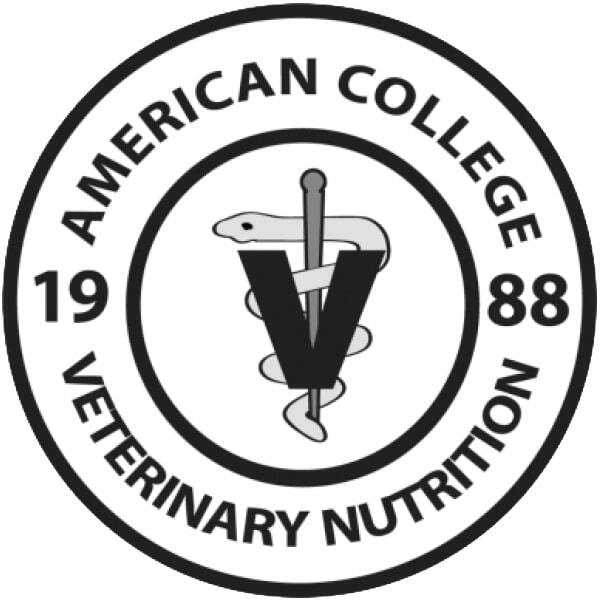 She received her DVM from University of Tennessee and completed a small animal rotating internship at Oradell Animal Hospital in Paramus, New Jersey, before returning to University of Tennessee to complete her small animal clinical nutrition residency.